This tutorial explains how to intentionally crash or hang your PC. 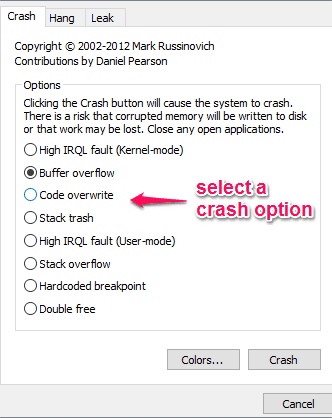 There is a free software that lets you crash or hang your PC by providing multiple options. This might sound crazy, but it can be useful for testing purpose for experts. The name of the software is ‘Not My Fault‘. You must have seen that blue screen or physical memory dump error that occurs when your PC crashes. This software lets you bring that error intentionally on your PC using 8 different options. And to hang your PC, you can select the available option and do a single click. Apart from these two main options, you can also prevent closing this application using two different options. After enabling this feature, when you close this application and restart the application, it will show an error. You also won’t be able to close the running process of this application using the Task Manager to run the application again (PC restart will be needed). Also, this software doesn’t provide any warning pop-up before crashing or hanging the PC. So, whatever option you choose, you must be sure what you are going to do. 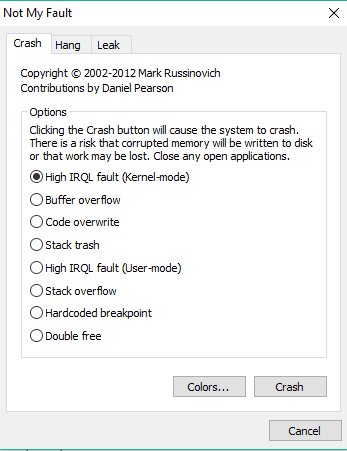 The screenshot above shows its interface and multiple options available to crash the PC. We have also covered some system monitoring software: Webtile PC++, thilmera7, and Wise System Monitor. How To Crash or Hang Your PC Intentionally Using This Software? Use this link to grab the zip file of this software. That file contains 32 and 64-bit versions. You can execute any version as per your PC requirement and the interface of this software will open. Its interface opens with Crash tab. There you will find 8 options using which you can crash your PC immediately: Buffer overflow, Stack trash, Stack overflow, Double free, Code overwrite, High IRQL fault (user-mode), High IRQL fault (Kernel-mode), and Hardcoded breakpoint. Select an option and click Crash button. Without any warning, it will crash your PC. The first two options are used to prevent the application from closing. You will be able to close the application interface, but won’t be able to close it from running in the background. 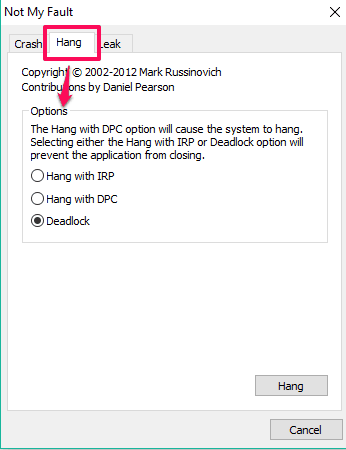 To hang your PC, you need to select Hang with DPC option and click on Hang button. Immediately, it will hang the system. You won’t be able to close this application interface, use File Explorer, or do any other thing. You have to force restart PC. There is also a third tab, named Leak. This tab also lets you hang PC by leaking paged and non-paged pool memory. You need to set leak value per second (in KBs) and select Leak or non-leaked button as per your need. You can also leave this tab if you don’t have much idea. I think there won’t be any strong reason for regular users to use this software, but it can be helpful for people who want to analyse crash related techniques and to store crash dump reports. So, whatever is the case, before doing anything, keep in mind that you have created a restore point and your files and system settings are backed up by you.